A miniature painting of the burning of the The Knights Templar, in the presence of King Philip Augustus “The Fair.” Though originally of Christian faith and highly regarded throughout the courts of Europe and the Church, during the Inquisition the Templars were suddenly accused of allegedly being a heretical sect due to their differing spiritual practice from the mainstream version of the day Church of Rome, and were executed accordingly. Not all spiritual beliefs are considered equal today, even in western societies that supposedly cherish the principle of religious freedom. Scholars estimate there to be tens of thousands of religions worldwide. 1 If you belong to one of the major religions, your beliefs will generally be considered respectable and have mainstream acceptance. But if you belong to a smaller religious group, especially one that deviates from what is considered “normal” in society, you might receive very different treatment. Small religious groups, are at particular risk of being labelled a “cult” and considered potentially dangerous or harmful. 2 This can happen quite easily, not because of anything a group has done, but simply because they are a small religious movement, which today is becoming synonymous with being a “cult”. But who gets to decide which spiritual groups are “cults” and which are legitimate? Our understanding of what a “cult” is has not appeared spontaneously or naturally. Rather, it is a category that has been deliberately created over several decades by those who have aimed to demonize and attack smaller and alternative forms of spirituality. Those behind this effort are commonly known as the “anti-cult movement” or ACM. There is no single entity called the “anti-cult movement”; the term is applied to a loosely affiliated group of organizations, psychologists, deprogrammers, academics, lawyers, former “cult” members, and families of current and former members. They share an opposition to “destructive cults”, which they claim are dangerous and harmful to society, and aim to warn society about these dangers and limit the ability of “cult” groups and their members to function. 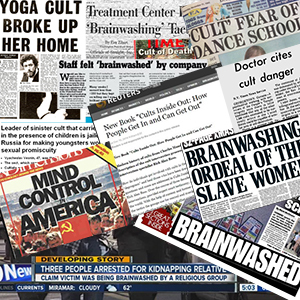 Mass media headlines are frequently saturated with the words “cult”, “brainwashing”, “mind control” coupled with sensationalized stories of crimes, danger, sexual abuse, family breakups, financial abuse, and so on, cementing fear and paranoia of looming alleged dangerous cults all around. Judged by the degree to which their ideology has entered the mainstream, they have been very successful. Many ideas invented and propagated by the ACM have become conventional wisdom; for example, the use of the term “cult” in journalism and common speech as if its meaning is self-evident, the popular acceptance of “brainwashing” as a real phenomenon, and the commonly accepted belief that “cults” are dangerous and harmful. This article is the story of how that happened. It will describe the anti-cult movement, its history, its ideology, and its impact on society. The ACM has tried to cultivate a sympathetic public face, epitomized by devastated families of “cultists” and traumatized former members sharing horrific tales. If you dig a bit deeper, however, this sympathetic public face does not hold up to serious scrutiny. There is a lesser-known history of the anti-cult movement — a tale of religious freedom suppressed, civil liberties violated, and religious movements smeared by vicious propaganda. The anti-cult movement’s negative impact on spiritual freedom has been profound, and it continues into the present day. The word “cult” first emerged as a pejorative term to define these deviant Christian sects in 1938, with the publication of The Chaos of the Cults by Jan Karel Van Baalen. This is when the word “cult” began to take on a meaning similar to the word “heresy.” Walter Martin went on to popularize and expand the usage of this term in books such as Rise of the Cults (1955) and Kingdom of the Cults (1965), which are influential to this day. Martin’s work was pivotal in shaping what is known today as the “counter-cult movement” or CCM. The CCM has roots in the Christian Evangelical movement and criticizes new religious movements from a theological perspective. 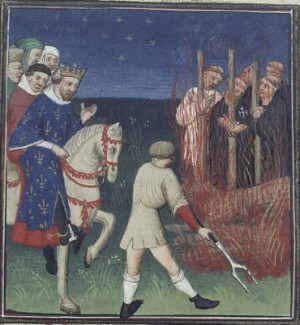 By literally transplanting the word “cult” for the word “heresy,” the CCM is the clearest example of the philosophical link between the modern-day opponents to “cults” and demonization of unpopular minority viewpoints as “heretical” throughout history, such as the violent oppression of the Cathars in the 13th century and the bloody history of the Inquisition. In the early 1970s, a new wave of opposition to new religious movements emerged: what has become known as the anti-cult movement. Unlike the counter-cult movement, which attacks “cults” for deviating from Christian Evangelical teachings, the new wave of opposition criticized “cults” from a secular perspective. The Anti-Cult Movement accused “cults” of having “destructive behaviour” — such as brainwashing their members, breaking up families, and so on — instead of criticizing their doctrines. 5 This approach has been very successful in portraying “cults” as harmful to society, as well as expanding the cult label to cover virtually any type of alternative spiritual group. Why has the ACM been so successful? One possible reason is that their secular approach allowed them to gain empathy from people from every background and walk of life. The anti-cult movement cloaks their prejudice behind concepts such as “protecting families” and “restoring free will” that have very broad public appeal, regardless of faith. Additionally, the ACM has used theories such as brainwashing that had apparent scientific weight (even if long debunked). They used support from a few highly visible figures in the psychiatric profession to lend scientific legitimacy to their claims. This approach has allowed the ACM to make a significant impact in both courts of law and public opinion. But to truly understand where this approach came from and why it was effective, we must first understand the social context from which the ACM arose. The 1960s and 70s saw a “surge in structured experimental communities and religious movements”. 6 These groups presented a variety of strange but attractive spiritual perspectives to a generation of Americans who were interested in exploring a spiritual way of life outside the Judeo-Christian/capitalist mainstream. Many of these new movements presented exotic eastern teachings that few North Americans had been exposed to before — for example, the International Society for Krishna Consciousness or the Transcendental Meditation school of Maharishi Yogi. Other groups such as the Children of God or the Unification Church maintained a Christian orientation but promoted very different beliefs from mainstream Christianity and in some cases advocated counter-culture values that diverged sharply from the norms of society. One powerful symbol of these times is the 1967 trip taken by the Beatles to visit to the ashram of Maharishi Yogi in India. The Beatles were at the height of their fame, and their visit had an enduring impact on popular culture. It exposed a new generation of young people to eastern spirituality in general and Transcendental Meditation in particular 8. This vintage news footage shows the Beatles visiting India in 1967. Note the snide jabs that the announcer (clearly a bit skeptical) manages to sneak in. Presented under Fair Use. Why Did These New Religious Movements Face So Much Opposition? There was a lot of diversity in the beliefs and practices of various new religious movements; many had little in common from a spiritual perspective. However, the movements that sparked a lot of opposition initially all inspired a radical change in those who joined them. But the teachings of spiritual figures from thousands of years ago have become absorbed into mainstream culture. In the process, their teachings have been adapted to the norms of a society that is highly materialistic. In contrast, the teachings of many new religious movements that emerged in the 1960s and 70s inspired radical action and profound changes in behaviour and lifestyle. For the families of adherents joining these movements, and for society at large, these changes could seem incomprehensible. However, even though the parent-child conflict explains much of the early opposition to NRMs, it does not necessarily explain why other individuals without a family member in an NRM (academics, psychologists, deprogrammers etc.) became involved in an effort to attack those groups as “destructive cults”. Could it be that the conflict within families is simply the most obvious front in a broader struggle going on within society? As the quote above suggests, this broader struggle could be seen as taking place between the dominant values of a society (as upheld by parents, the ACM, and other authority figures) and values that in various ways reject that dominant social structure and undermine its premises (as promoted by new religious movements). For example, when young, intelligent people, brought up with lives of comfort and opportunity, turn around and reject that lifestyle, abandon education and careers, give up possessions, and go live in an intentional community or devote themselves to missionary work for a strange new religion — this could be seen as a very real threat to the society whose values they are rejecting. Some individuals and groups, regardless of family affiliation, have an interest in defending the dominant social order and attacking those who would subvert it. It’s also not unreasonable to observe that those who sit atop the pyramid of the power structures in society — the religious, political, and economic leaders of the day and those who support them — are the ones who have the greatest interest in preserving the status quo and stamping out dissent. What impact would it have on these people if there were mass movements in society to adopt radically different perspectives and ways of living? From this perspective, the anti-cult movement could be seen as a kind of retaliatory force emerging within society, stamping out beliefs and lifestyles that undermined mainstream values. If you think this sounds extreme, just consider that in many cases, the ACM used intense physical and psychological force to make members of new religious movements reject their faith and return to the mainstream fold. When parents saw their children joining New Religious Movements — giving away a comfortable middle-class lifestyle, careers, education, and possessions in order to pursue a vision of spiritual development — it was cause in many cases for moral panic and active opposition. Many parents struggled to accept the spiritual choices of their legally adult children. They began to network with other parents and devise ways to “rescue” these adults from the choices they had made. Some parents opted to forcefully make their children change their beliefs by any means necessary. Here we encounter one of the primary contradictions of the anti-cult movement: America (as most western nations) is a country that deeply cherishes the value of freedom (at least in principle) and in particular the freedom of religion. How could families justify forcefully preventing the exercise of free religious choice, no matter how upset or concerned they might be? The solution to this ethical (and public relations) problem was to assume that the member of the new religious movement was not under their own control. Parents would claim their child was “psychologically kidnapped” and required a “rescue” from the group controlling them. 14 From this perspective, parents could rationalize that their children were not actually participating in any legitimate religious experience. They had simply become manipulated and needed saving from the sinister group that had entrapped them. This ideology of “cults” using “mind control” or “brainwashing” to control people was crucial to ACM success. It allowed parents to present their objections to their children joining New Religious Movements as a struggle between an innocent family and a sinister “cult” group, rather than an inter-family squabble. It was a concept that many people could empathize with, even though it fundamentally denied the religious nature of what the NRM members were seeking, as well as the free will and human rights of the members themselves. “Brainwashing” was the perfect explanation to explain the behaviour of those who joined “cults” — never mind that it had no scientific or factual basis. It was an explanation that placed all of the blame on the “cult” and none on the member. The solution that emerged to this made-up problem was the ghastly practice of deprogramming. Deprogramming is a practice that intends to force someone committed to a religion or spiritual movement to sever that committment and reject their religious beliefs. Deprogrammers often lacked any formal training in counselling. They were effectively bullies for hire, with an apparently deep antipathy towards the NRMs they were removing people from. The legal foundations for deprogramming were always dubious at best. Some families of NRM members attempted to shore up these foundations by using the courts to gain custody of their legally adult children. If the parents could be declared the conservators of their children, then they would be legally justified in using force to remove them from the NRM group environment. These individual efforts were reinforced by lobbying at the state and national level to make certain “cults” be declared illegal or to add “cult criteria” to the laws governing such custody requests, to make it easier for judges to grant it. Some parents did succeed in gaining custody of their children through the intervention of sympathetic judges. This effectively labelled the NRM member as incapacitated due to their religious affiliation and left them basically prisoners to the will of their parents. 26 But in many custody cases, new religious movements and civil libertarians fought back on behalf of their members, accusing deprogrammers of kidnapping and claiming religious discrimination. However, despite these legal and regulatory defeats, the ACM was far more successful in the battle for public opinion. The publicity surrounding such legal cases, and the ACM’s efforts to “educate” the public were succeeding in creating a stigma around “cults”. There was also an external event in the late 1970s that would help empower the ACM and etch the archteype of the “destructive cult” into the public consciousness. This was the tragedy of the People’s Temple in Jonestown. Jonestown was a pivotal moment for the anti-cult movement. The ACM had long attempted to construct an aura of fear and danger around alternative spiritual groups. With this tragic event, that aura crystallized in real life in the most horrible way imaginable. Jim Jones was a charismatic preacher who had founded The People’s Temple, a new religious movement with a blend of Christian and Socialist ideals. From its base in California, The People’s Temple had initially attracted support and recognition for its progressive stances on civil rights and other social issues. But after a string of negative publicity, Jones and some members of his congregation moved to an intentional community in Guyana, which came to be known as Jonestown. The community eventually numbered about 1,200. In 1978, United States Congressman Leo Ryan visited the community, investigating reports that some members were being held against their will. Out of 1,100 people, 16 chose to return home with the congressman. However, they never made it off the ground, as the Congressman Ryan and several journalists were murdered on the airstrip by unknown gunman. As the official story goes, the rest of the community at Jonestown then committed mass-suicide, with hundreds of brainwashed “cultists” drinking the poisoned Kool-Aid on command. Reporters visiting Guyana sent home horrifying photographs of rows of “cultists”, including many children, all apparently dead of suicide. The media covered the story intensely, reinforcing the narrative of the charismatic “cult leader” causing mass destruction. Today, this narrative has become widely accepted as the truth; anyone arguing a contrary view is at risk of being labelled a “conspiracy theorist” and a kook. However, is this really the whole story? There are many disturbing anomalies and unanswered questions about Jonestown. From the initial coroner’s reports that the majority of the dead were in fact murdered to the troubling allegations of CIA involvement in Jonestown, there appears to be far more to this event than the official account can explain. The panic generated by the events of Jonestown also gave new life to the ACM organizationally, 31 contributing to a new phase of organizational development and maturity. With that in mind, in the next section we will consider the most prominent of these ACM organizations and the role they have played. Although resistance to New Religious Movements started as individual families focused on extracting a specific person from a specific group, this quickly changed. Families formed loose local networks, and this gave rise to more formal organizations. FREECOG, or “The Parents’ Committee to Free Our Children from the Children of God”, was founded in 1971 as one of the earliest secular anti-cult organizations. One of the founders was none other than Ted Patrick, (the “father of deprogramming” discussed above); it’s clear the ACM and deprogramming were intimately entwined from the start. FREECOG was initially focused on one specific new religious movement, but in 1974 it rebranded to become the Citizens Freedom Foundation (CFF) and expanded its sights to target a wide range of “dangerous cults”. 32 In 1978, after the events at Jonestown, the CFF re-branded again as the Cult Awareness Network (or “CAN”), the name by which it has become most well known. Along with its new name, CAN took on new leadership: Patricia Ryan, daughter of the Congressman Leo Ryan who was murdered at Jonestown, became CAN’s Executive Director. Even though the vast majority of groups in CAN’s files had never been found guilty of any wrong-doing and included relatively mainstream religions such as the Jehovah’s Witnesses, CAN did little to distinguish between “cults”, despite the huge differences between them. One reason for this broad brush approach is that CAN had very little incentive to depict new religious movements in a friendly light 35. In fact, CAN directly profited from its fear-mongering; one of CAN’s major activities was quietly referring distraught families to deprogramming services, in exchange for which CAN would receive a kickback. This activity was controversial for many reasons. CAN was officially an educational not-for-profit organization and tax exempt. As a requirement of achieving it’s tax exempt status, CAN could not publicly facilitate deprogrammings. In the anti-cult economy, families would contact CAN with information about a “cultist” and the group they had joined, which helped grow CAN’s database. In return for information about the “cultist”, and sometimes a donation, CAN would provide information about the group in question as well as a discrete referral to a deprogrammer. The deprogrammer would be paid a large sum, sometimes as high as $25,000, to kidnap and forcibly sever the commitment between the NRM member and the spiritual group they had joined. 38 In exchange for their money, the family would “recover” their lost relative, while the deprogrammer would pay a commission (sometimes in the form of a tax-exempt “donation”!) in exchange for the referral. This commission would be funnelled to CAN. The other prominent ACM organization is the American Family Foundation or AFF. Founded in 1979, it continues today under the name the International Cultic Studies Association (ICSA). AFF was a CAN affiliate that went on to became an independent organization. Whereas CAN offered education and public outreach, AFF became the intellectual and research wing of the ACM. Their efforts have been directed towards providing academic legitimacy to ACM ideology on topics such as brainwashing and the destructiveness of “cults”. They have created their own publications for that purpose, such as the International Journal of Cultic Studies. One major criticism that mainstream scholars have levelled against research from the anti-cult camp is that these studies have rarely examined the current members of NRMs but rather have focused on a limited set of information from ex-members, specifically those who had been deprogrammed. 43 As we will see below, this type of evidence is extremely problematic and potentially misleading. NRM members who leave and become hostile to their previous group are often referred to academically as “apostates” and their negative testimony as “atrocity stories”. While there are no doubt some individuals who have had legitimate negative experiences with some new religious movements, the phenenon of apostate testimony in general is extremely suspect — especially when used in an effort to restrict the liberties of minority spiritual groups. To begin with, there is a lengthy and ugly history of using apostate atrocity stories as a justification for the persecution of “heresies”. Even across centuries and differing social contexts, such apostate accounts have some remarkable similarities. A popular genre of anti-Catholic literature contained the supposed atrocity stories of nuns who had escaped from the convent. In these stories, the nuns claimed to have been held captive psychologically by threats of going to hell if they left (brainwashing?). However, somehow they had escaped the clutches of the convent and now shared tales of its horrors with a respectable Protestant audience. A similar strain of anti-Mormon writing provides the supposed accounts of escaped polygamous wives. Like the nuns in the convent, these mormon wives were not physical prisoners. Somehow they were restrained psychologically, held captive by “mesmerism” (considered a kind of hypnosis). Both types of writing typically ended with a call to action, such as for government intervention or even violence to wipe the perpetrators of these atrocities out. This type of writing sometimes had severe consequences; one nun’s convent was actually burned to the ground by a mob after telling her story. It is easy to see the parallels between these stories and the modern day atrocity stories told by former “cult” members. All contain strange, unfamiliar religious groups that violate the dominant social norms. All contain a psychological mechanism (fear of hell, hypnosis, brainwashing) used to explain how supposed victims were kept “imprisoned” against their will, despite the absence of any physical source of confinement. In addition to providing a justification for the persection of minority spiritual groups, atrocity stories also provide a convenient moral cover for the repented “cultist” (or “heretic”). These stories allow the apostate to recuperate their image and to absolve themselves of blame by using their psychological entrapment as a convenient excuse for past behaviour. 47 How could one be held responsible for something if they were “brainwashed” by a “dangerous cult” at the time? Finally, evidence suggests that many of the negative perspectives adopted by apostates could in fact be attributable to the deprogramming process itself. Replicable scientific studies have found that members who were forcibly deprogrammed and had contact with the anti-cult movement were far more negative than those who had left by a natural process of disaffiliation. Those members who had been deprogrammed were far more likely to believe they had been brainwashed, that their former the leader was wrong, that the group’s doctrine was wrong, and so on. 48 In other words, those members who had been forcibly indoctrinated with anti-cult ideology were the ones most likely to agree with it. In summary, atrocity stories have a long history of being used to persecute unpopular spiritual minorities; they have similar patterns in narrative structure over time; they have a self-serving purpose in enabling apostates to absolve themselves from blame; and the negative perspectives of apostates seem causally related to deprogramming. For all these reasons, accepting apostate testimony uncritically or using it as the sole evidence against a new religious movement is very problematic. However, this evidence would be put to the test in court during the next phase of ACM development, as a rising tide of apostates began to sue their former groups. For the ACM, supporting these lawsuits had numerous advantages. Lawsuits could potentially have the “cult” in question pronounced guilty in a court of law and bankrupted through huge settlements. 50 This strategy also had the benefit of placing the lurid and sensationalist testimony of the apostate in the public eye. Amplified by a media eager for a juicy “cult” story, atrocity stories became powerful ammunition in the battle against NRMs. In a series of high-profile legal cases, a core tenent of anti-cult ideology would be scrutinzed: the doctrine of “brainwashing”. Today, this phrase is used in common speech as if it’s meaning is self-evident. However, brainwashing has never been validated scientifically and is not considered a credible theory by mainstream psychologists or sociologists. In fact, the notion of brainwashing actually has roots in CIA propoganda. The concept of brainwashing first appeared during the Cold War, as a way of explaining why Korean prisoners-of-war could be converted into followers of Communism. 51 It originates with Edward Hunter, a journalist who was later revealed to be an undercover CIA operative and psychological warfare expert. Brainwashing made its way into popular culture during the 1950s with a series of books and films, most notably in the 1959 political thriller, The Manchurian Candidate, in which a U.S. solider is captured by the Communist Chinese and “programmed” to carry out a political murder without his knowledge or consent. A rudimentary notion of brainwashing was used to explain the behaviour of members of new religious movements from the beginning of the ACM, but in the late 1970s a few psychologists and academics expanded on the theory and gave it greater legitimacy. However, the challenge that emerged for Singer was that her theory lacked a scientific basis and became increasingly discredited; towards the end of the 80’s, it was rejected in numerous legal cases and by the scientific and academic community. In the legal arena, the most significant ruling occurred in 1990, in the case Fishman v. United States. In that case, presiding Judge Jensen concluded: “theories regarding the coercive persuasion practiced by religious cults are not sufficiently established to be admitted as evidence in federal courts of law”. 58 This ruling was a massive blow to the brainwashing theorem. Although some ACM-affiliated scholars would continue to advocate it, brainwashing would no longer be accepted as a valid argument in US courts. The scientific demise of Singer’s brainwashing theorem was a victory of sorts for new religious movements. However, the general public typically does not review the the minutiae of legal rulings. In the public mind, brainwashing retained its credibility even if in academic circles it had not. In 1991, a woman named Kathy Tonkin contacted the Cult Awareness Network with concerns about her three sons and their affiliation with a Pentecostalist church. Tonkin was eventually referred to a deprogrammer, who successfully deprogrammed Tonkin’s two younger sons (who were minorities), and then prepared to go after Jason Scott, Tonkin’s eldest son who was a legal adult. The deprogrammer and a three-man “security team” abducted Scott, handcuffed him, taped his mouth shut, and took him to a specially prepared beach house for a five day deprogramming. Scott eventually pretended to have had a change of heart, which convinced the deprogrammer of his success. They reunited with Scott’s family for a celebratory dinner, during which Scott went to the washroom alone and escaped to the police station. This failed deprogramming led to a 1993 civil lawsuit against the deprogrammer, his accomplices, and CAN, which was included for making the initial referral to the deprogrammer. Punitive damages against the deprogrammer were $2.5 million with $1 million against CAN. Both ended up filing bankruptcy. The Cult Awareness Network — the most significant ACM organization and the heart of the “anti-cult economy” — had been thoroughly destroyed. The End of the Cult Wars — Which Side Won? So have we entered a new era of religious tolerance? Sadly, it appears that while the cause of religious liberty has won a few battles, the war itself is far from over. For example, while brainwashing may lack support academically, this does little to help the cause of those accused of being “cults” if the vast majority of the general public still believes brainwashing is real. After all, most people do not study up on complicated legal decisions or read the reports of APA committees. We get information from pop culture, mainstream news reporting, public education, and social interaction. The information available from these channels tends to reinforce and perpetuate the stereotypical views of “cults”. A quick search for “brainwashed cults” in Google News reveals plenty of references, and the stereotypes of “cults” and the dangerous “cult leaders” are very much alive. If new religious movements and their members rarely face forcible abductions or lawsuits today, the pressures against them are no less real; if they are less visible, they are also more insidious. This is a kind of oppression that is unseen and unrecognized, often even by those who suffer its effects. This makes it especially difficult to change. Outside of North America, the fate of new religious movements is even more dire. The actions of a few destructive groups in Europe, such as the Solar Temple suicides, had a massive impact in European countries, where American mind control ideology was imported and achieved official recognition in some cases. France and Belgium officially accept brainwashing theory, and France maintains a government list of “sects” that practice “mental manipulation” and has an official office called “the Interministerial Commission to Make War on the Sects”. 64 Anti-cult sentiment in Russia is strong, promoted by the powerful Russian Orthodox Church. 65 China is notorious for its violent persecution of any religious groups not authorized by the government. Both subtle and overt, discrimination against alternative spirituality continues around the world, a lasting legacy of the anti-cult movement. This article will use the more neutral term “new religious movement” favoured by most scholars of religion and sociology when referring to alternative spiritual groups in place of the pejorative term “cult”. Bromley and Shupe, “Anti-cultism in the United States,” 225. Lewis, James R. Legitimating New Religions. New Brunswick, N.J.: Rutgers University Press, 2003. 162. LeMoult, John E. “Deprogramming Members of Religious Sects.” Fordham Law Review 46, no. 4 (1978): 601. LeMoult, “Deprogramming Members of Religious Sects,” 599. CFF is the Citizens Freedom Foundation, the predecessor of the Cult Awareness Network, which was the foremost Anti-Cult Organization before its eventual bankruptcy. It will be discussed in detail below. Lewis, James R. Legitimating New Religions. New Brunswick, N.J.: Rutgers University Press, 2003. 197. Anti-cultism in the United States: Origins, Ideology, and Organizational Development, Bromley and Shupe, 1995, #? Shupe, Anson, Bromley, David G., and Darnell, Susan E. “The North American Anti-Cult Movement: Vicissitudes of Success and Failure.” In The Oxford Handbook of New Religious Movements, edited by James R. Lewis, 184-205. New York: Oxford University Press, 2008. #. Lewis, James R. Legitimating New Religions. New Brunswick, N.J.: Rutgers University Press, 2003. #. Introvigne, Massimo. “Advocacy, Brainwashing Theories, and New Religious Movements.” Religion 44, no. 2 (2014): 308. Lewis, James R. Legitimating New Religions. New Brunswick, N.J.: Rutgers University Press, 2003. 203. Lewis, James R. Legitimating New Religions. New Brunswick, N.J.: Rutgers University Press, 2003. 172. Lewis, James R. Legitimating New Religions. New Brunswick, N.J.: Rutgers University Press, 2003. 163-167. Introvigne, Massimo. “Advocacy, Brainwashing Theories, and New Religious Movements.” Religion 44, no. 2 (2014): 304. Introvigne, Massimo. “Advocacy, Brainwashing Theories, and New Religious Movements.” Religion 44, no. 2 (2014): 305. Introvigne, Massimo. “Advocacy, Brainwashing Theories, and New Religious Movements.” Religion 44, no. 2 (2014): 310. Introvigne, Massimo. “Advocacy, Brainwashing Theories, and New Religious Movements.” Religion 44, no. 2 (2014): 314. Lewis, James R. Legitimating New Religions. New Brunswick, N.J.: Rutgers University Press, 2003. 160. Shupe, Anson, Bromley, David G., and Darnell, Susan E. “The North American Anti-Cult Movement: Vicissitudes of Success and Failure.” In The Oxford Handbook of New Religious Movements, edited by James R. Lewis, 184-205. New York: Oxford University Press, 2008.